With fall just around the corner, it’s time for back to school sports, fall marathon training and more activities that require hydration for kids and adults alike. Four of our kids are fairly active in sports. Shelby's got roller derby and Emma plays softball. Juliann is into volleyball. And Logan is very involved in Cross Country, Track & Field, and basketball. Keeping properly hydrated is essential, especially during and after a strenuous activity. I was recently introduced to BODYARMOR, a natural sports drink made with coconut water and no flavors, colors or sweeteners. BODYARMOUR is high in vitamins and potassium, and low in sodium. It has more potassium-packed electrolytes than other sports drinks. 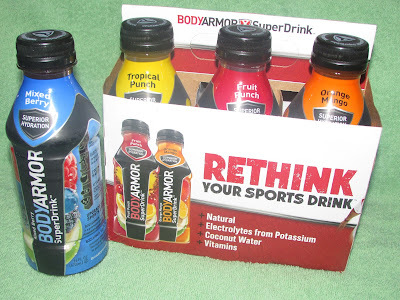 Each bottle of BODYARMOR natural sports drink is 16 fl. oz. and there are seven flavors to choose from - Fruit Punch, Strawberry Banana, Orange Mango, Mixed Berry, Grape, Tropical Punch, and Lemon Lime. Although celebrity endorsements make no influence on my purchasing decisions, there are several high-level pro athletes who drink BODYARMOR. Of my four kids who are involved in sports, Logan is the most particular about what he puts in his body. I knew that he'd be the most opinionated about his thoughts on BODYARMOR. The other kids are more about the flavor, while Logan will weigh nutritional factors and other criteria. BODYARMOR passed his critique. I'm not much into sports, but would still drink BODYARMOR to keep me hydrated. The flavors are good, especially Tropical Punch and Mixed Berry. I didn't care much for the Lemon Lime flavor but I don't normally care for that flavor anyway. 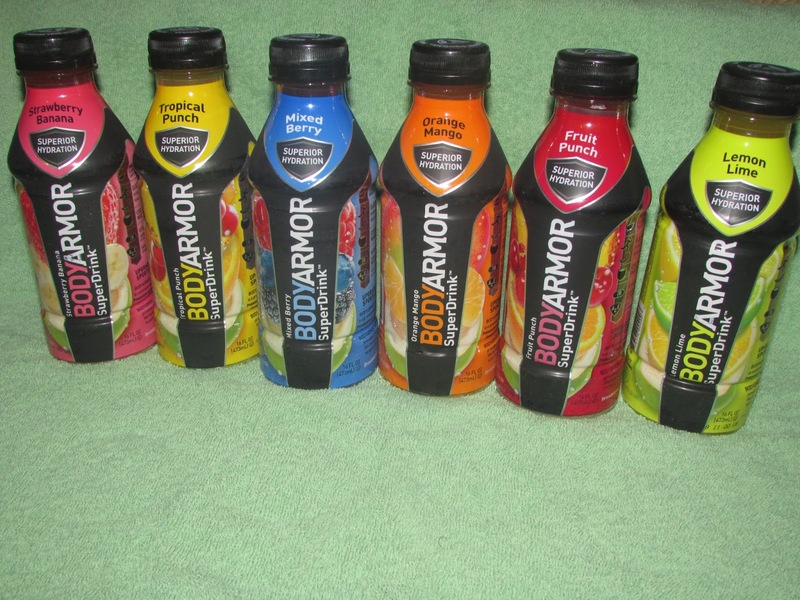 I noticed that BODYARMOR has less sugar and carbs than some other sports drinks on the market. It also doesn't have that salty taste that sometimes comes from other sports drinks. There's a minimal coconut taste from the coconut water but it's not overpowering. My teens find the bottle packaging to be appealing. One person will win a 6-pack of BODYARMOR natural sports drink. I would probably enjoy the grape flavor best. I would like to try Orange Mango. I would most like to try the Orange Mango flavor! I've tried the Fruit Punch flavor before, and loved it! I'd be interested in trying the Tropical Punch flavor too, along with a few others. I've been buying this for my kids for months! They love it. It's MUCH healthier than the popular sports drinks & I don't mind spending a little extra to keep this in stock. We love the orange mango, grape, & tropical flavors. This would be good to try on one of my long runs. I'd like to try the orange mango. Thanks for the giveaway. I'd like to try Orange Mango. That sounds wonderful. I would love to try the Grape. Orange/Mango sounds really good too. Em Mahr - I'd most like to try the grape flavor. The first flavor I think that I'd try would be Orange Mango. I think that the fruit punch flavor would be my favorite. Orange mango sounds best to me, I think! I would love to try the orange mango flavor. I want to try Orange Mango! I would like to try the Mixed Berry flavor of BODYARMOR Sports Drinks. I'd love to try the banana! My son is on a medicine that causes his body to lose electrolytes. This would be really good for him and I know we'd love to try the fruit punch. It's usually our favorite. I would love to try the Strawberry Banana first. They all sound good!! lindsayhess84@ yahoo dot com. We would most like to try the Mango Orange drink. It sounds yummy! I would like to try fruit punch! I would like to try the fruit punch flavor first. I'd like to try the lemon lime flavor. We'd like to try Strawberry Banana and Grape! I think I would like grape. I would love to try the strawberry banana. I love anything with banana. I would love to try strawberry banana! That's my go-to flavor for smoothies, fruit juices, etc.